Home | Port Macquarie Safaris Pty. Ltd. Experience a Peaceful and Unique Ride on a Camel- Along Some of Australia's Most Majestic Coastline. 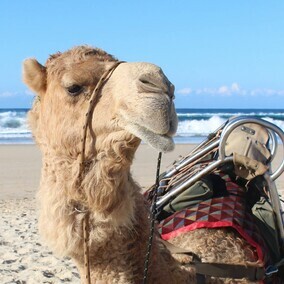 Welcome to the famous Port Macquarie Camel Safaris on Lighthouse Beach. You are invited to enjoy a unique and fun filled experience on Port Macquarie’s most beautiful southerly beach. You will be warmly greeted and looked after by friendly and experienced cameleers. Hop aboard one of Australia’s own camels and be delighted with stories, amazing facts and history of this incredible ‘ship of the desert’. Dolphins are frequently seen dancing the waves and whales are commonly seen migrating during the whale season. Where else could you experience a sight like this? - from the elevated view on the back of a camel gently meandering along the golden sands of Lighthouse Beach. Be sure to bring your camera. A fun, educational and memorable experience for the whole family.